It’s been a while since we’ve been able to sit down with a tipster and get a proper interview with them but we had a little time and took the chance to get THREE whole interviews done, we’ll be releasing them one at a time once a week. 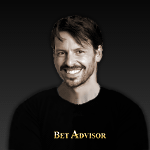 First up it’s one of BetAdvisors newest Basketball tipsters, you may know him as Divol from Priceform: Dmitry Lebedev. 1. How long have you been tipping on the NBA? I started watching NBA for the first time in 1993 NBA Finals between Suns and Bulls and got hooked ever since. Betting on NBA I started though ten years later, in 2003. I noticed that I was really good predicting surprises and winners of the game and decided to try it a bit and it was really bad. Lost my entire bankroll within very short time. Stopped betting for sometime and returned only in 2005, this time realizing that gambling is much more than picking winners and been keeping winning seasons since then, trying to get 7th winning season straight right now. Having said that, I’m not taking winning season as a given and know that bad streaks can be very long and very bad for any capper, no matter how good he is and I’m trying to always stay alert and progress. 2. What has been your best ever bet? It’s hard to tell and don’t know how to judge. Most money won? Defining moment? Good run? Good prediction? I remember deciding to ride out the Unders in 2008 Conference Finals and went 9 – 0, somehow having the sense to avoid betting on Unders in two only Overs of the series. Was really proud of myself for that. I always happy when I can find some angle or spot that can bring moment for several games. Kings first half Over two seasons ago was a bet I took a lot and it proved itself. Sunday early game Under was really very good spot three years ago going 11 – 2 at some point. 3. What rules do you live by for professional betting? To be honest, I don’t have many rules. I’m trying not to limit myself and to try and improve all the time. I can say that right now, I’m trying to be much more selective. Trying to avoid betting double digits lines, because of the high chance of back door covers. I’m a big believer that history tends to repeat itself and that there are small teams that big teams have problems dealing with for several seasons or some special tendency in games between two teams (always tight games, even if one of the teams gets big line or high/ low score, regardless of teams scoring abilities overall), so trying to look beyond team’s current form only. 4. How has the NBA’s late start affected your selections for this season? I’m relying much less on previous seasons stats, because this season is very different. Paying extra attention to potential look aheads and schedule situations. It’s obvious that in such a season, teams will forfeit even more games than usual, trying to save themselves for post season or if they have a big rival coming the day after. Great example we could see on Friday with Sacramento winning in San Antonio that had Texan derby against Houston on Saturday and Denver and Knicks both struggle and not covering and giving players tons of rest, like Nene not playing at all (Knicks lost SU), before playing each other (after Carmelo’s trade, this game took special meaning to players on both teams) and such examples you can find in almost every round. 5. Who will be the highest points scorer in the NBA this season in your opinion? Right now it’s easily Kobe Bryant. LeBron doesn’t play as if he wants the title and with Wade getting back sooner or later, I believe he will go down on numbers a bit. Durant can fight for the title of course, but Thunder are a team first of all. Lakers on the other hand, are a team of three players, Kobe, Bynum and Gasol and nothing more after that. If some trade won’t be done, all three will continue to boost their numbers. 6. If you had to make a large bet on one side being this years NBA Champions, who would it be? It’s always hard to make predictions before trade deadline, because you know that there are teams like Lakers that want to make a megatrade that can change the entire picture. But, if there won’t be major trades and/ or injuries, Thunder will take the West. Can’t see any team in the West that can beat them in best of 7. Thunder should have home court advantage the entire way up to NBA Finals and have one of the loudest crowds in the league. They have one of the three best players in the league and one of the three best PG’s in the West. They have great defense, great offense, role players that should be on a championship team. On the East it will be a mega battle between Heat and Bulls. Right now, I give the edge to Chicago. They brought the one player they missed last year, Rip. He is exactly what this team needed to make the extra step. Boozer will have extra year (hopefully without injuries) to get in to Bulls system and Tom Thibodeau, last season was his first season as head coach and he should have learnt his lessons. Heat with big trio can’t be overlooked for obvious reasons, but till LBJ shows he can show up in money time, I give the edge to Bulls here. So as I can see it now, Bulls – Thunder is the NBA Finals and really can’t say who will win it between the two. Click the image to see Dmitrys full record and statistics.